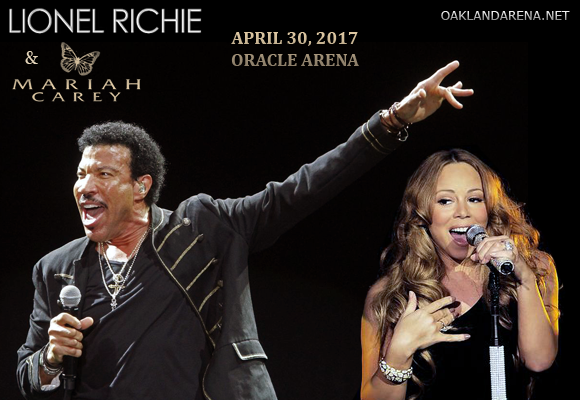 The king and queen of pop, Lionel Richie & Mariah Carey, have joined forces for the All the Hits Tour, which comes to Oracle Arena on Sunday 30th April 2017! These two icons of modern music will be performing all of the fan favorites and hit singles from their incredible careers, and putting on a high-energy show that will dazzle and delight! What are you waiting for? Book now! Lionel Richie is an American singer, songwriter and instrumentalist who began his career in 1968 as lead singer and saxophonist for The Commodores, who are known for hits such as "Machine Gun", "Brick House" and romantic, easy-listening ballads such as "Easy", "Three Times a Lady", "Still", and "Sail On." In 1982, Richie launched his solo career with the release of his eponymous debut album, which went on to score three hit singles: the U.S. #1 song "Truly", and the top five hits "You Are" and "My Love". Richie is now considered one of the best-selling artists of this century, selling over 100 million records worldwide, with hits like “Endless Love," "All Night Long (All Night)," "Hello," "Say You, Say Me," and "Dancing on the Ceiling". He has won four Grammy Awards, one Golden Globe Award and an Oscar.